Used for adorning the hands and legs, henna has been in huge demand over the years. Now, it’s time to grace the belly with henna. Read on to know the top 10 belly henna designs. Henna mehendi holds a significant place in Indian culture. 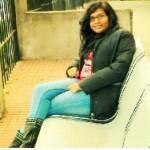 Nowadays, it’s gaining popularity even in other parts of the world. It’s the most loved form of temporary tattoo. No painful process is involved in it yet it looks really beautiful. Many women love to get it done on their belly. 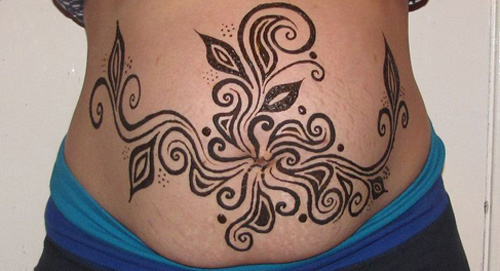 Some pregnant women also have various religious beliefs associated with belly henna mehendi. 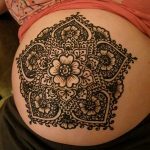 In this article, I shall be sharing the most loved and favorite belly henna designs which you can try for yourself. This is a very simple and elegant henna belly art. It is made around the belly button. Due to its small size, it looks even more beautiful. If you wish to flaunt your flat belly and add more beauty to it, you should definitely try this henna design. I seriously loved this design. Beautiful thin leaves, an auspicious ‘Ohm’ and a ‘kalasha’ around the belly button make this design really adorable. It has the basic Indian mehendi design essence which makes it even more beautiful and attractive. 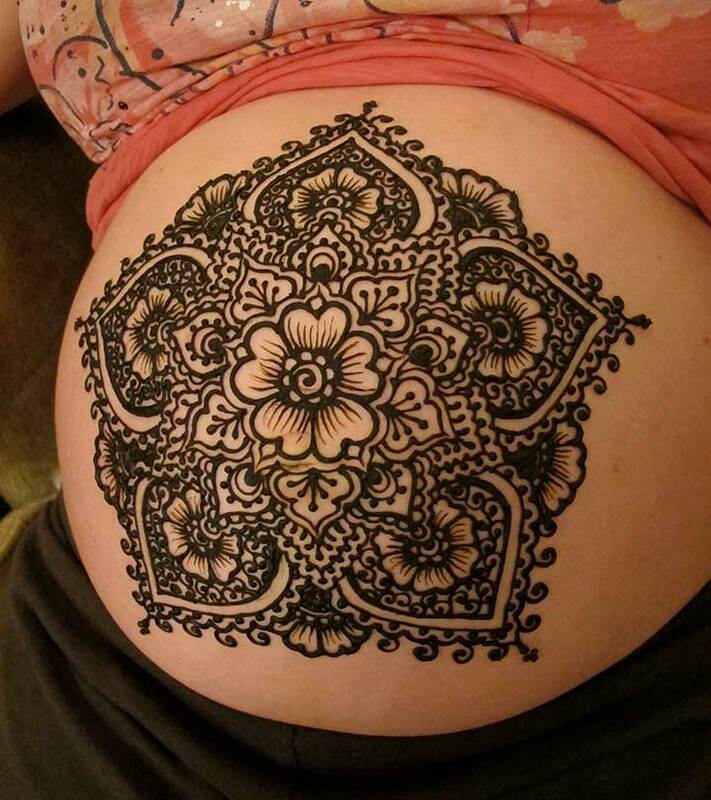 This is comparatively a big belly henna design which is covering almost the entire front area of the belly. Though there are waves and swishes in this design, you will get the essence of a big flower when you look at it as a whole. This is what makes this design so unique. Like all other tattoo designs, people love to get their loved one’s names written on their body parts. Here in this design, the name of the girl is written at the centre of the design while it is surrounded by two beautiful fishes which make this design very appealing and unique. I just loved this henna on belly. Three hands, all of different sizes and filled with different patterns, look really beautiful on the belly. It feels as if someone is giving a touch of love which is full of serenity and peace. I am really impressed with this temporary tattoo belly design and would surely love to try it on. If you are spiritual in nature and firmly believe in God, then this design is for you. 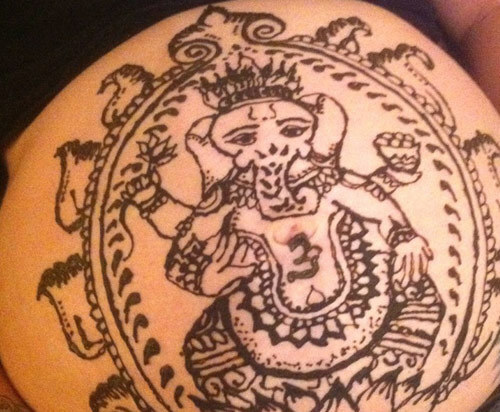 This big Ganesha Ji belly henna design is loved by women, especially in India. It not only looks beautiful but also makes you feel that God is always there with you. You can get it done as shown in the picture or replace Ganesha Ji’s idol with any other god’s idol as per your choice. 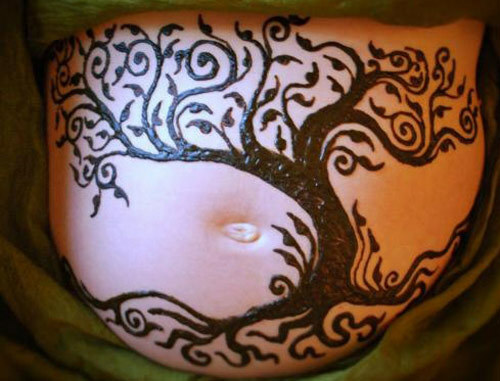 The tree motif is one of the most common and loved belly henna designs. But of all the tree designs I have seen, I just loved this one. It has a very appealing and deep impact, when you look at it. It’s partially covering your belly but the way it has been made is really unique. 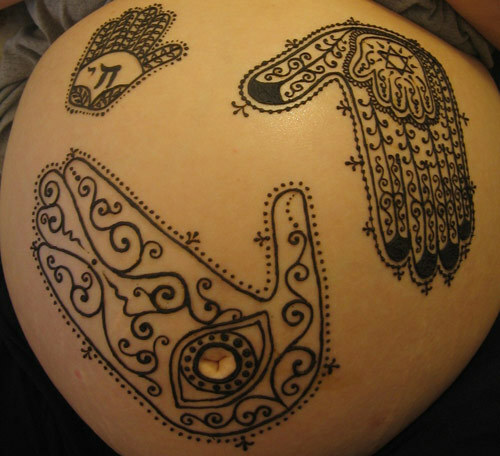 This is yet another beautiful and appealing belly henna design. While most of the henna designs are not colored, this particular design has been decorated with glitter and bindi which make this simple design look attractive. The lotus motif is loved by all. 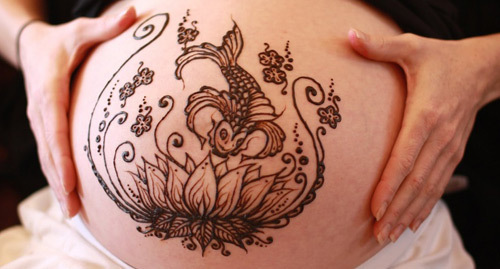 The beauty of the lotus flower has been depicted through this beautiful lotus belly henna design. A beautiful fish on top of it and various small flowers around the lotus make this design sober and beautiful. I totally loved this design. The heart is one of the most commonly made designs all over the world. 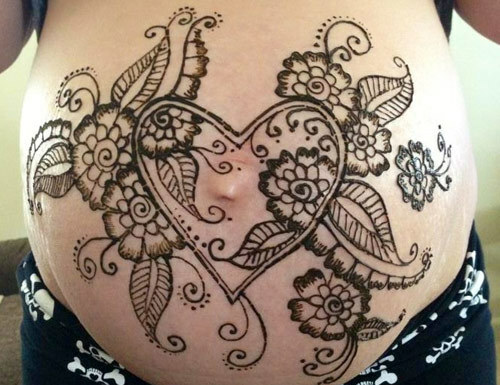 So, how can we miss the heart design in our list of the top 10 belly henna designs? Here comes one of the best designs with a big heart in it along with some really beautiful flowers and leaves. It’s a very simple yet adorable design. 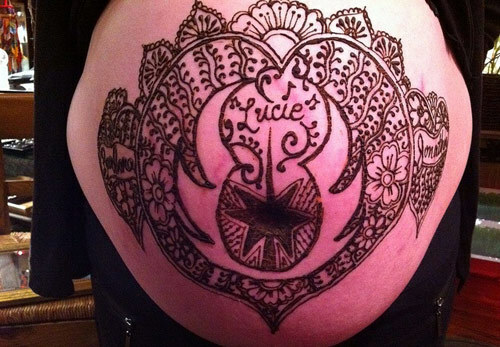 Hope you loved all the listed designs that also include pregnant belly henna designs and would love to try them. Please share your views with us; we would love to hear your feedback.